Social Movements to oppose the apartheid regime began in the 1950s. The aims of these anti-apartheid movements were to educate people about the situation in South Africa, to bring out of the shadows the cooperation of European states with the apartheid regime, and consequently to isolate the regime economically and culturally. 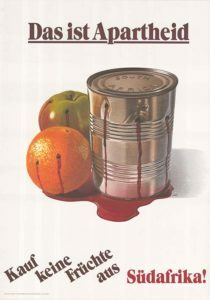 The food boycott in particular became an important instrument. 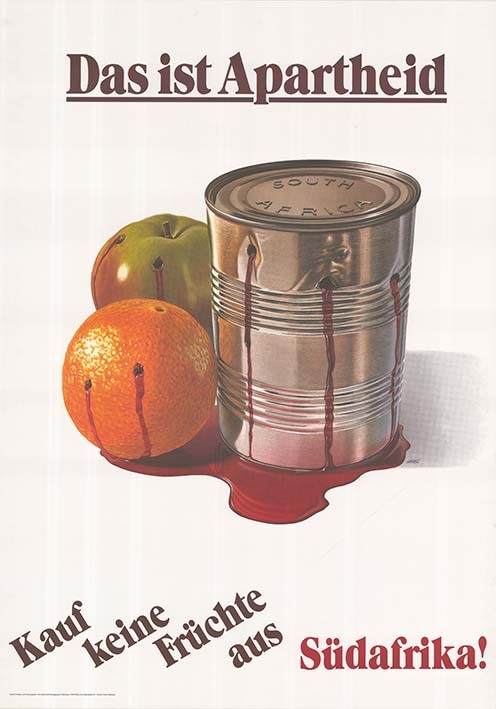 The Protestant Women in Germany, for example, put up posters urging the public not to buy fruit from South Africa. 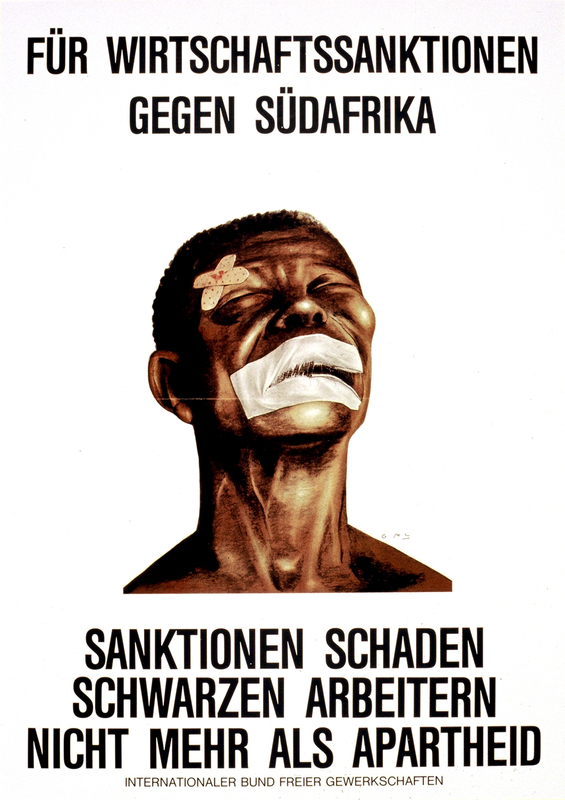 In Switzerland too, an anti-apartheid movement developed, appealing not only to the government, the food industry and the big banks, but also to the population, since the government refused to join in the sanctions against South Africa and, according to The Anti-Apartheid Movement (AAB) directly supported the regime through its neutral stance. 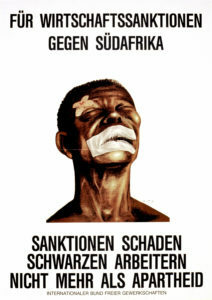 A broadcast in the summer of 1986 on the situation in South Africa by LoRa, an alternative local radio station in Zurich, resulted in a poster exhibition on the South African boycott call by artists. The cultural boycott consisted on the one hand in the mobilization of writers, musicians and artists in the fight against apartheid, and on the other hand in the cessation of all cultural exchange with South Africa. The call for a cultural boycott was already made in 1954 by the Anti-Apartheid Movement (AAM), before the African National Congress (ANC) called in 1959 for a boycott of South Africa at all levels. Various cultural associations and trade unions followed this appeal, so that the British Musicians’ Union was already urging its members to isolate South Africa in 1961. Bands like the Rolling Stones and the Beatles boycotted the regime in the early years. In 1969, the UN General Assembly appealed to all countries to break off all exchange with South Africa. At the end of the 1970s, the government of the apartheid regime tried to break through the cultural isolation by offering high fees to musicians in return for performances in Sun City. The UN responded by tightening the boycott. In addition, the UN Special Committee Against Apartheid began in 1983 to publish a list, the so-called Cultural Register, with artists who, ignoring the boycott, had performed in South Africa; Elton John, Wishbone Ash and Nazareth are just some of the better-known musicians to be found on this list. In addition to the cultural and economic boycott, there were further actions to oppose the apartheid regime. For example, some music-making artists from outside South Africa composed so-called Freedom Songs. Well-known examples include Sun City by Artists United Against Apartheid, a protest and boycott song against the Sun City Amusement Resort in Bophutatswana, the self-evident Free Nelson Mandela by the Specials or Gimme Hope Jo’anna by Eddy Grant, speaking of the government of South Africa, the apartheid policy and the eponymous city of Johannesburg, to which the title of the song refers. Artists United Against Apartheid: Sun City, on: ibid. : Sun City, Manhattan Records 1985. Eddy Grant: Gimme Hope Jo’anna, on: ibid. : Gimme Hope Jo’anna, EMI Records 1988.